I mentioned I have been trying on other mesh heads recently, because I have pretty much become addicted to the sharp features in snapshots. And, with so many artists making appliers for the LeLutka heads, there’s a ton you can do to customize and still be you…so here’s another head I have added to my growing collection. This one by Eve’olution. Head #1 in beta. It’s pretty striking how different it is from my normal look. I do like it but it definitely needed to be in beta, because there’s a lot I would change when the full version comes out. But, it’s available for 50% off with updates for life so if you do like the head, it’s a reasonable time to purchase. No harm in seeing where it goes! I’m showing the head with appliers from Elysium. There is a massive pack of stuff you get with your skin purchase, including a freckled version and Maitreya Lara appliers for both. My favorite thing about the head is the built in lashes. They are SO well done. I never show my LeLutka lashes unless I am closing my eyes, but these are natural, fluttery and tintable. One of the biggest issues I had was the slow time the built in skins took to rez on my avatar. 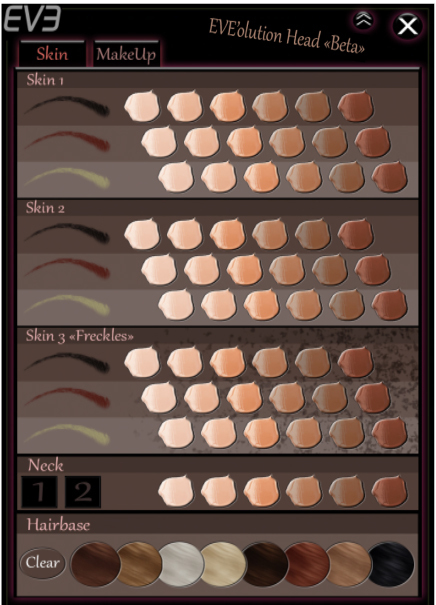 Any change seemed to take minutes, as opposed to seconds for my LetLuka built in skins from Glam Affair. I don’t know the technical ins and outs but I would think that’s an optimization issue. Since I don’t have any of the associated Lara body tones for the built in skins, I am not showing them here, but there are 6 of them per eyebrow option in the HUD, which you can see below.